Local News / Re: Judge Long Jr. Breaks leg in freak accident. He has pins plates and screws, he said he crushed one of the bones pretty good.. I started this whole roasting thing when I was Rajah, best thing I ever did. Walter is having a roast? Rick remember everyone reads it whether they admit it or not! Local News / Press release.. Standoff..
At approximately 12:13am on Dec.18, 2007, the Pulaski County 911 Communication Center notified the Pulaski County Sheriff’s Department of a disturbance in progress at 308 South Commercial Street in Crocker, Missouri. The Crocker Police were requesting assistance from the Sheriff’s Department. The Deputies on duty were familiar with the residence since they had served five orders of protection on a male subject who lives at the residence at 11:25pm on Dec. 17, 2007. The male subject had been removed from the residence at that time. When the Crocker Police Officer arrived on scene he advised that the male subject had a weapon and had pointed it at his head before ducking back into the house. Upon their arrival at the scene the deputies assisted the Crocker Police in clearing the house and removing the family members from the residence. As they were clearing the house two Pulaski County Deputies came face to face with the male subject who was hiding behind a furnace in the basement. This occurred at approximately 12:28am and the subject was armed with a handgun. A standoff between the suspect who refused to surrender and the Deputies began. Additional Deputies, Missouri State Troopers and Command staff members from both the Crocker City Police Department and the Pulaski County Sheriff responded to the scene. The standoff continued while Deputies attempted to talk the subject into surrender. At approximately 1:39am the suspect agreed to surrender. He unloaded the weapon in front of the officers and placed it on the floor. The Deputies then approached him and placed him in handcuffs. There were no injuries to the suspect, the officers or family members during this incident. At this time the suspect has been secured at the Pulaski Country jail. Since criminal charges are pending he will not be identified. The officers from the Crocker City Police Department and the Pulaski County Sheriff’s Department are continuing their investigation. Statements of probable cause will be sent to the Pulaski County Prosecutor reference this incident. A follow up news release on this incident will be issued as necessary. That, and did I ever tell you how he burnt his parents house down after attempting to fix the heater? I don't have to tell him, he will have plenty of time to read my lame board now. Oh my gosh. I feel bad for him I really do. But that is a funny story. Seems his honor has just read this and asked I remove it.. NAW!! Says he never reads my board. My phone rang in under 5 minutes. Local News / Judge Long Jr. Breaks leg in freak accident. Seems Colin Long broke his smaller leg bone playing ping pong... LOL... Fibula? Right? He claimed he may have been over killing the ball.. Good thing he wasn't playing a manly sport he could have broke a hip at his age and girth. Memorial donations may be made in my name at my store. His surgery is tommorow in Columbia..
And NO I am not the person who requested the other thread be locked. This thread has been locked by request. Local News / Dixon house fire. Calls are going out for 210 North High Street in Dixon Missouri, Residential Structure Fire. Mark give it a break, you are doing no more that bolstering the side of local law enforcement. This subject has been put to bed months ago. You lost the battles, let it go.. Welcome aboard for the next to last column of 2007. It seems like only yesterday when I wrote column number one of the year. Time sure does fly when you are under pressure. Next thing you know the trees will be turning green. And today I cannot wait for that green day. As I write this column I am looking out over my white yard and thinking to myself, it would be nice if Santa brought the department a few more 4X4 vehicles. The road division grabbed all of out 4X4’s last night in order to answer calls. According to rumor control one road deputy bounced our detectives previously owned Durango off a guardrail. But the same rumor said the damage was a few scratches. I suspect I will get the “official” news a little later today. Since I have a lot of background experience with playing in the snow in a Patrol car I also know from experience that on a night like last night that there were a few police cars totaled out around the state. If all we had were a few scratches then we did just fine. In one sense we are like the fire fighters. When they broadcast that there are five accidents around the 163mm curve on I-44 the sensible thing to do would be stay away from that spot on the highway. Nope, we head to the worst part of the road. Just like the firemen charge the burning house and enter. Moral of this story, all police officers and firemen are nuts! Still if Santa were to bring us a few more 4X4’s we would be very happy. Driving around in the type of slop we had last night in a rear wheel vehicle and going to all the bad spots does create a little excitement at times. You also find that you are soon on a first name basis with the local wrecker drivers. Speaking of cars I would like to report that we have had a good year with our cars. The vast majority of our needed repairs have been for fairly minor stuff. In 2006 we spent $115,424.08 for all auto expense. In 2005 it was $101,199.00. So far this year we have spent $118,925.30 on auto expense. Which is just a hair over what we did last year. With repairs and the price of gasoline this year that seems to be pretty good. Unfortunately the Commissioners only gave us $100,000.00 for auto expense this year so we are officially over budget at this time. The case number count this morning stands at 8,833. With fifteen days left in the month I suspect that we will break the 9,000 mark. I would rather see a recession in calls but that is not going to happen. As I recall the 2004-year calls for service number was only 3,912. So yes Pulaski County is growing. It would be nice if the Sheriff’s Department could also grow a little. As of Nov. 30, 2007, we had spent $266,270.00 for inmate board. Since we have a month to go and the budget was only for $270,000.00 I suspect we will be well over budget on inmate board for the year. The real good note is inmate medical expense. So far this year we have spent only $48,430.41. And that is a far cry from the 2003-2004 inmate medical totals of $178,000.00 and $183,000.00. But we have one month to go and you never know what will happen next. We might even come in under budget. This past week our Detective Division has been busy. They had to investigate a suicide by hanging at a Richland address and the death of a young man that was not witnessed at a Dixon address. Neither case had any signs of foul play. Both were sent for full autopsy and toxicology screens. It will be eight weeks or so before we have some answers in these cases. I did not do a press release on either case. I did talk in person with two of our local media outlets about both of these cases and our local media did not feel they were the type of stories that we in the nature of a compelling public story. They did not want the story on either case and I was quite happy not to write the release. I am only reporting the cases here in the column because they did represent a heavy investment in time and some expense by our Detective Division. In other news, we are working on the 2008 budget at this time. We are trying to close out some old criminal cases. And I get to report that the Crime Star computer system update has been accomplished. We now have that “room full of filing cabinets” in our system to fill with reports. I am not sure I have anything else to report so I think I will close out for today by asking all of you to drive safe and stay legal. The jail lights are ON! Pulaski Enquirer / Re: What are they building next to Miller Real Estate? Little history is that the building that used to stand their was my familys H&R Block offices. I remember back when Tyce Smith moved to town and we rented him his office in our building. I can't believe no one knows what they are building. Welcome aboard for a wet cold week in Pulaski County. Maybe we will have a week with a nice coat of ice. I sure do hope the weather guy is wrong, wrong, and very wrong, on this forecast. But if he is right, then please drive very careful and very slow on the highways in Pulaski County. I would like to start this column with the November dispatch numbers. And once again dispatch had a good month. In the telephone call list they had 4,409 calls. That makes a grand total so far this year of 58,538. At the front window they had 1,188 visitors, the total for the year stands at 18,366. They had 37 animal calls, total 369. They had 31 domestics, total of 77, and they had 5 warrant arrests for the month and 36 for the year. Please remember we have only been tracking the animal calls, domestics and warrant arrests for a few months. Any way you want to look at this picture the dispatch section has been busy. The case number count for the week stands at 8,643. And that is the new high record for the department. And that will stand at least until next week. Once again I would like to remind everyone that Pulaski County has 550 square miles with 51,579 people and the two or three Deputies we have on duty at any given time have responded to 8,643 possible cases so far this year. I just got back from the Richland Christmas Parade. It was wet, cold, and muddy. But there were a lot of smiles in the crowd and a lot of Christmas spirit in the air. I think my candy throwing aim is improving. I did not bean a single child in the head today. I did nail two REACT members with direct hits but I must confess those hits were not accidents. Merry Christmas guys! We had an unexpected event last week. It seems that we have hit the storage limit on our files in Crimestar. As the computer geeks explained it the version of Crimestar that we bought in 2004 had a limit on storage. They said to look at it as though we had a single file cabinet with four drawers in one room for storage. That file cabinet is now full and the system has crashed. What we need is the expanded system, which would be like an entire room full of file cabinets. And joy to the world we only need $1200.00 to make this happen. Well the timing on this at the end of the budget year is just great. Not only are we low on money but also the bill payments for the County stop this next week. But we are not dead in the water they told me my credit was good so we should be back in business by the middle of next week. While I was driving along in the Richland Parade this morning I could not help but notice that several Richland City Police cars were using LED emergency lights. And last week I saw that both the Crocker and Waynesville City Police Departments also have LED equipped units on the road. So does the St. Robert City Police. The conversion by the Missouri State Highway Patrol to all LED bars is well underway. In a way this may turn out to be funny. We led the way in buying the LED’s for our cars and we may soon find ourselves with two of the last old-fashioned light bars left in Pulaski County. All but two of our cars are LED equipped. Those two cars both have used MX-7000 light bars that are in good shape and will last another six or so years for sure and may go longer. On Friday I attended the 25th Judicial Circuit Court En Banc meeting at the Phelps County Courthouse. I have made it a practice to attend these meetings each time they are held. For those we do not know what the Court En Banc is think of it as a meeting of all Judges in the 25th Circuit. They work on the problems that have come up in the Circuit and look for ways to enhance the business working of the Circuit. I have come to the conclusion that we have a pretty sharp bunch of Judges working this Circuit. They also seem to be ahead of the curve when it comes to new programs. One such program that Texas and Phelps County now have will soon appear in Maries and Pulaski County. And that program is the new drug court. I do not have the space needed to talk about this concept change but I sure like what I am hearing about the program. Here in Pulaski County we have far to many citizens who are addicted to illegal narcotics. The drug court will offer a special new way to handle these people. The objective is to help, force, or otherwise make them leave the world of illegal drugs. It is not a program where they can “play along” with the system and achieve consideration from the Judges. They are going to have to work and earn the consideration. I like the idea because it we can take 30 or 40 of our worst drug addicts off the street forever then we will cut crime and in general boost our County upward. And even better the Judges are making this work without spending tax money. The bottom line is simple I cannot wait for Pulaski County to get into this program. I guess I could close with another round of cautions about driving on icy roads but for most of the people who read this column in a paper by the time you read these words we are supposed to have sunny conditions. So I will just say please drive careful and make all of your actions legal. It is such a drag to get thrown in jail during the Christmas Holiday period. And we do not have red, green, or other colors of lights on in the jail. Just plain old white bulbs, but they are ON! I wish I could tell the joke I heard about this matter today. At approximately 2:00am on 12-3-07, a Pulaski County Deputy stopped a vehicle for an equipment violation near the junction of Mo. 17 and Ichord Avenue in Waynesville, Missouri. The female driver of the vehicle was found to be driving with a suspended drivers license. Additional investigation revealed that she was also driving while intoxicated. There were two young children in the vehicle. A male passenger in the vehicle fled the scene on foot and ran into the nearby trees. The Deputy requested back up and additional Pulaski County Deputies and members of the Waynesville City Police Department responded to the scene. Following a short manhunt the male passenger was located. The male passenger was determined to be Antoine Devon Haggard, age 28, who gave a Springfield, Missouri, address as his place of residence. Haggard was found to have an active Federal warrant for his arrest as a parole absconder. His original charge had been trafficking in cocaine. Haggard was taken to the Pulaski County jail. He will be released to the custody of the United States Marshal Service on Dec. 3, 2007. The driver of the vehicle was also taken to the Pulaski County jail. Her charges will be driving while suspended and driving while intoxicated. A statement of probable cause for two counts of child endangerment in the second degree has been sent to the Pulaski County Prosecutor for review. Both of the children were released to the custody of the Missouri Division of Family Service for safekeeping. Local News / Re: Christmas Parade Pictures Today. I know he looks like Santa, is a big as Santa but that's actually Geezer Glide Taz. Does this guy look familiar to anyone?? I didn't take those pictures. But wishful thinking on your part. LOL. I was in the sleigh disguised as a stocking (Stocking/Stalking get it?). Rick Lepard stalker extraordinarie at your service. I took some pictures do you want others to post too? Local News / Christmas Parade Pictures Today. During the course of an investigation requested by the Miller County Sheriff’s Department, a Pulaski County Deputy attempted to locate a missing person from Miller County. The exact address of the subject was unknown so the Pulaski County Deputy was searching an area off Texas Road in Pulaski County. While driving on Texas road the Deputy met the missing person driving a vehicle that Miller County had reported as taken without the owner consent. The Pulaski County Deputy stopped the vehicle on State Rt. Z near Texas Read at 10:58am on 11-30-07. As part of the investigation at the scene of the vehicle stop the deputy requested the assistance of a K-9 drug dog and a reserve Pulaski County Deputy along with his dog was called out. The dog gave a positive alert and the deputies located crack pipes with residue. The two female occupants of the vehicle were arrested for possession of narcotic paraphernalia and possession of a controlled substance. The vehicle was towed to a local garage for safekeeping at the owner’s request. The identity of the female subjects will not be released at this time. Welcome aboard for one more visit with the Pulaski County Sheriff’s Department. It seems hard to believe that December is already here but we cannot deny that fact. It also seems hard to believe that year three of a four year term of election is almost over and that next year will be re-run year. I suspect that the next election will get very interesting when that time arrives. I will start this column with the calls for service/ case number/ jobs we did number for this week. And the new high number is 8,510. Last week it was 8,360, and that was only an increase of 150. If that low trend continues and if I did my math right that means we may just barely break the 9,000 mark for the year. We do not need the growth in this area. I have very good news to report for this week. I have received a check for $750.00 from the Order of the Rainbow Girls, Masonic Lodge, Pulaski County Assembly #78. The young ladies had requested that the money be spent on a repeater radio for one of the cars. I would like to thank the young ladies for their kind gift. Since I have now reported this donation it means that this will give me a chance to update everyone on the car repeater radio program. We ran into a problem that involved a technical decision that needed to be made. In talking with another radio service I learned that we could buy an extender that would give us a two-mile radius instead of the current seven hundred yards. That would be a big boost in range but the cost was $1400.00 per radio instead of the $750.00. The question we had to decide, in simple terms, was the increase in price along with the range boosts something that we had to have? After a long hard look at the program I decided that 97% of the time the Deputy would be within the 700-yard radius of his/her vehicle. Thus if we purchased the lower cost units I could get a unit into every road car much faster. Since we are working on this program using money that we receive as gifts that was a critical point. At this time we have three cars with the new repeaters installed and we are making appointments for two more cars next week. That will leave seven more cars that we need to equip. We did run into a problem with the program. We had all of our hand held units programmed to operate off the new repeater units last year in anticipation of the new repeaters. Somehow we ended up with the wrong frequency’s to make the system work. We have already contacted the vendor and this problem should be cured next week. I would like to report that one of the new “toys” that we purchased, the Alternate Light Source unit, has arrived in house. And after sitting idle for only four days our Detective Division got to use the unit at a reported sexual assault crime scene. The ALS unit was a success and DNA material that we probably would not have found the old fashioned way was recovered. I referred to the unit as a “toy” because there has been some recent criticism that I am always buying expensive “toys” that we do not need. In this case the unit was needed and the CLERF fund paid for this forensic tool. I think it was a very smart move on our part but I also know that the election year bull has already started. 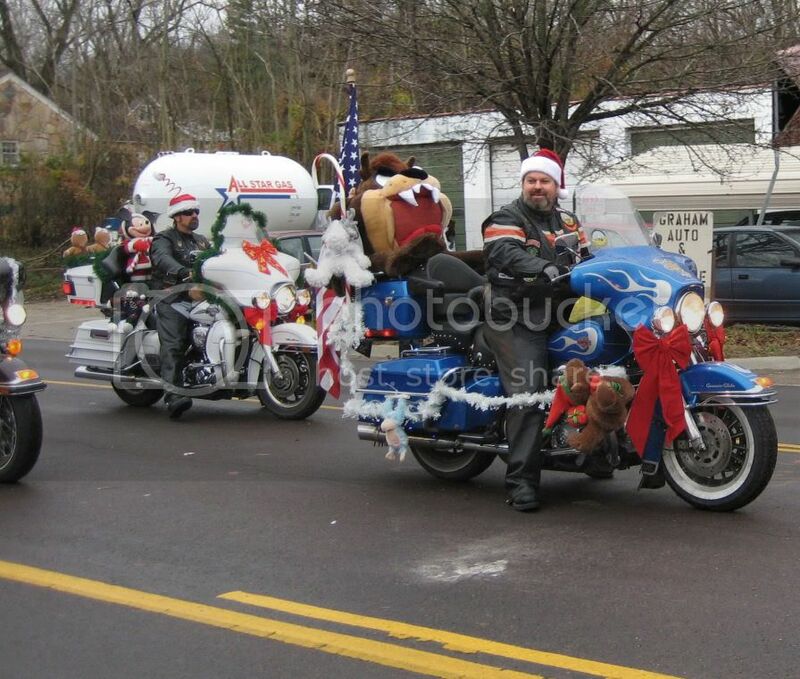 This week was the Christmas Parade week. On Saturday I attended the Laquey and Crocker Christmas Parades. This is probably one of the best jobs I get to handle. You get to ride in the parade, wave at people and see a lot of folks you have not seen for some time. Every once in a while you also miss with a candy toss and bean some poor young child in the head. Usually they shake their head once or twice and then they dive to the ground to capture the offending candy missile. I must assume that revenge follows and the candy missile meets an early demise. But yes the look on the kids face as a handful of candy suddenly lands at their feet makes for a real neat job for the day. The weather for the Laquey and Crocker Parade was not very good but it looks like the Waynesville Parade on Sunday will be much better. Since the Waynesville High School football champs are going to be in the parade I look for a larger than usual crowd. And if by chance I bean your child in the head with a bad candy throw I would like to apologize in advance. During this past week we seized 21 pounds of marijuana in a special criminal operation and I completed a press release on this operation. I had a reader ask why did I release that information? In this case the news that there was 21 less pounds for sale was good news and besides the people involved have already had DEA and Sheriff’s badges held up in front of their faces. Since they are well aware of the fact that they have lost their expensive imported material I did not see a need for the secret to remain hidden from everyone else. I seem to have reached the word count for this week. I would like to remind everyone that the weather could play a big role in safe driving in the near future so please pay attention and drive SLOW. I would also like to ask you to stay legal in your actions since we do not need your business in the jail. We are full but the lights are on. Neither has more than one known hit, do they? Jim Dandy and ? So you consider Black Oak Arkansas or Ozark Mountain Daredevils no names? Their (BOA) riders are ok with that sound system? There would only be one band. Just so you understand, name bands cost alot of money. I might be able to get Black Oak or the Daredevils for about $5000 each. So, say I could get BOA for $5000, along with 2 other local bands $600, plus a sound/light company $500, that means I have to make $6700 to break even, as $20 per person, that means I would have to bring in 335 people to pay off the bands. Since this would be trying to raise money for the Shrine Club and Children Hospital, if I brought in 500 people, I would raise a whole $3300 for the charity. While $20 sounds like a lot at first, I went online to ticket master, and looked at the first concert they had listed, which was Bon Jovi, in Omaha where tickets cost $53-$99. Hannah Montana, for kids, cost 54.25 in little rock. Plus, drinks and food there will be 3-10 time more at a venue like that than at the shrine club. On Wednesday Nov. 21 and Friday Nov. 25, 2007 a joint drug operation was conducted in Pulaski County. The departments involved were the Richland City Police Department, Lake Area Narcotic Enforcement Group, the Pulaski County Sheriff’s Department and the Drug Enforcement Administration. During this operation approximately 21 pounds of marijuana that was being shipped to an address in the 400 block of Rosemary Lane in Richland, Missouri, was intercepted and seized. A number of promising leads were developed during this operation and officers have conducted a series of follow up interviews over the past few days. The people involved in the narcotic shipment are now aware that officers have seized their shipment and at this time secrecy is no longer required. The investigation will continue.